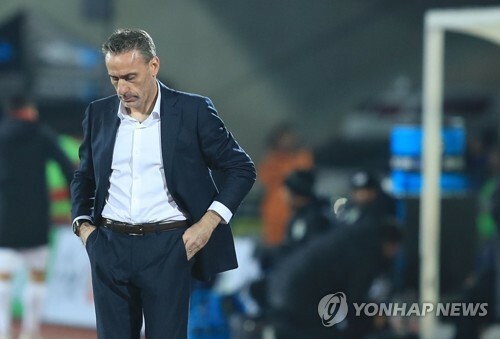 CHEONAN, South Korea, Oct. 16 (Yonhap) — South Korean football coach Paulo Bento lamented his side’s lack of pace on offense after playing to a 2-2 draw with Panama on Tuesday. South Korea, 55th in the latest FIFA rankings, blew a two-goal lead against 70th-ranked Panama, at Cheonan Stadium in Cheonan, South Chungcheong Province, on Tuesday. The two sides were meeting for the first time. Bento made five changes from his team’s previous lineup against Uruguay on Friday. South Korea got their opening goal in the fourth minute with Park Joo-ho’s strike and their second goal in the 31st with Hwang In-beom’s right-footed effort. However, South Korea gave up a goal to Abdiel Arroyo in the 44th minute off a set piece and conceded an equalizer in the 48th following a stray pass by Nam Tae-hee. In their previous matches, Bento’s style of football showed a build-up process from the back, quick transitions — whether defense to offense, or offense to defense — for an up-tempo, fast-paced game. The friendly against Panama was South Korea’s last home match in this year. The Taeguk Warriors are scheduled to face Australia and Uzbekistan next month, and both matches will be played in Brisbane, Australia. Bento said he is still in the process of deciding on the backbone of the national team before entering the Asian Football Confederation (AFC) Asian Cup in January. Against Panama, Bento made a slight change in his 4-3-3 formation. Instead of fielding two defensive midfielders, he deployed Ki Sung-yueng to be a deep-lying playmaker in front of the back four and gave more offensive freedom to Hwang In-beom and Nam Tae-hee.